How Do You Justify Your Bad Habit? From the age of 13 I was addicted to Diet Coke. But not that addicted, of course. I had “rules”, you see. Truthfully, I drank so much more than I ever admitted to myself. Weekends were different though. Things were better at the weekend (for me and my bad habits, at least). I’d allow myself to buy several 2-litre bottles of Diet Coke. I didn’t drink alcohol then, so it was fiiiine! If others could drink beer or cocktails, I could treat myself to a Diet Coke, right? When I was studying for exams, or essay-writing, or writing my dissertation, I’d buy in a few large bottles of Diet Coke. It would let me work solidly without ever having to leave home to buy more. The caffeine would enable me to concentrate and it would let me stay up longer at night to get more work done. So, really, I was just being productive. One time, in fourth year at university, I needed to do an all-nighter to finish two essays, so I bought a 6-pack of Diet Dr Pepper. I don’t even like it but I guessed it would do the trick. I stayed up all night, wrote both essays, and even got to my government job on time the next day. Diet Coke was also something I could have when I went out to a restaurant. Free refills were especially welcome. A large glass of freezing cold Diet Coke with a ton of ice was perfect. At times, I’d look forward to the drink more than the meal itself. When I stayed in Dallas for two months in 2013, I was both working solidly on a huge amount of projects for work and was writing my master’s dissertation (and I spent a week in California to go to Disneyland with friends - my priorities were definitely in the right place!) When I was working, I spent more time at my desk in the apartment than I did actually seeing my Texan family and Dallas itself. So, copious amounts of Diet Coke were a must. Obviously. By the time I was an undergraduate at university, friends started noticing my excessive Diet Coke-drinking. I’d drink it a lot before my 9am classes so I could concentrate more and it was my drink of choice on nights out — a terrible idea, by the way - I often felt more ‘hungover’ than my friends who’d been drinking vodka. Friends warned me about the dangers of drinking too much of it: “It will give you bad anxiety” / “You should drink full-fat Coke, it’s actually better for you!”/ “what’s even in that stuff?” / "I only drink water and cranberry juice." I was stubborn (and addicted) enough to ignore their advice completely and carry on. I convinced myself that Diet Coke was better than alcohol, smoking, energy drinks, and sweets. Besides, it's zero calories, surely better than tea with milk? Soon after, I began going out with my now-husband, Jack. He often laughed at how much Diet Coke I drank, but would also do his best to limit it, or at the very least, make me aware of my habits. Jack never stopped me from buying it but made weekly suggestions. He suggested it may be best for me to stop buying bottles to keep in the house. He would often ask how many cans I’d drunk that day. Most importantly, he opened my eyes to my bad habit. I thought about quitting. I tried quitting for Lent. I reduced my habit. Then I would drink more Diet Coke than before. Upon returning to Northern Ireland that Christmas, I read an article about diet drinks in TIME Magazine. It was the usual: ‘people who drink diet soft drinks tend to be more overweight than those who don’t’. There was also the stuff about cancer, Type 2 diabetes, and a number of other problems potentially associated with the artificial sweeteners found in those drinks. I read it and then thought about it briefly. Just like that, I made the split-second decision never to drink Diet Coke again. It wasn’t a particularly persuasive article but something in my head asked the question: ‘why do I even drink it?’ It doesn’t have a wonderful taste. It doesn’t have any benefits (apart from the caffeine — which, of course, shouldn’t be a benefit). So since that day, 31st December 2013, I haven’t had a single sip of Diet Coke. At first I got the headaches from lack of caffeine - so I drank tea, and I craved the fizziness with every meal - so I drank sparkling mineral water. Problem solved. No more Diet Coke. Thinking back, the memory of the taste of Diet Coke is not even that great. A tinge of metallic bubbles is how I’d would describe it best. Who even wants to drink that? I’ve discovered that the thing I looked forward to most when drinking Diet Coke was the fizz, not the taste. Keeping habits (and breaking bad habits) is a problem for those of us with ADHD. We get addicted to the things that make us concentrate, we find it tough to keep to new habits that actually are good for us, and we struggle to quit our vices. For me, it’s important to stop completely. No ifs, no buts. Then I told everyone. They all knew and they all held me accountable. Each time I thought about ordering a Diet Coke in a restaurant, or each time I actually did without thinking (this happened pretty frequently) I would get looks from those around me (‘Darnit! They remembered’). Oh and it turns out free tap water is cheaper than Diet Coke. (Who would have thought?!) I saved a ton of money. This advice can be used for life-altering addictions, such as to drugs, alcohol, or gambling, or for less dangerous, but still challenging addictions, such as an addiction to a game on your phone or to buying shoes. Make the decision yourself - you'll know when you're ready. Tell everyone - they'll make sure you don't go back. Don't allow yourself the tiniest amount. If it's bad for you, you need to stop doing that thing 100%. I recently listened to Episode 2 of Gretchen Rubin’s Happier with Gretchen Rubin podcast, in which she and her sister, Elizabeth Craft, discuss the difference between abstainers and moderators. I'd highly recommend subscribing to their podcast, by the way. Their tips are so relevant for those of us with ADHD! You can subscribe using the link here! They classify people into two types: those of us who need to completely quit something in order to give it up (abstainers) and those of us who can reduce our intake of something but continue with it in moderation (moderators). Even now, I still think of myself as a moderator — someone who can reduce their intake to a healthy amount. I didn’t think I’m a binge-eater, but looking back, I realise I was a binge-Diet Coke-drinker. Turns out, I’m clearly an abstainer. Sometimes it’s difficult to realise how bad our habits were until afterwards. If you fit into the category of 'I can quit at any time' (but you still haven't), perhaps you should reassess your type. We all like to think of ourselves as moderators but maybe you are actually an abstainer - you just don't know it yet. Because I had set rules for myself (only in a restaurant, only one can a day, only at the weekends, I don’t drink alcohol so it’s okay) I managed to justify every single sip of Diet Coke. The only way I could truly give it up was to abstain completely from drinking it and to never look back. I may drink more caffeinated tea now, but I’m slowly switching to peppermint, camomile, and echinacea. I may drink more sparkling mineral water, but I’m slowly switching to still water. Those good habits can be formed slowly by making more and more positive switches. For me, to stop doing a bad habit, I need to abstain 100%. P.S. 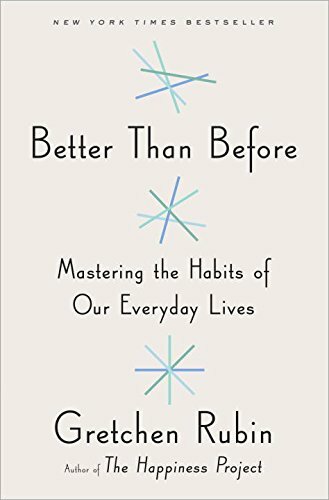 You can buy Gretchen Rubin's book, Better Than Before, on this subject from Amazon. She uses tips that are so easy to follow, like the 'one-minute rule', which I use all the time: if a task takes less than one minute to do, just do it now, don't think about it. This one tip alone has made me so much more productive! Are you an Abstainer or a Moderator? How do you quit bad habits? Share your experiences and tips below!